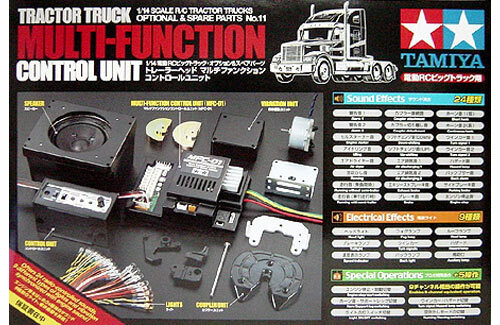 All Products > "56511 Tamiya Tractor Truck Multi Function Unit"
The multi function unit offers 24 radio-controlled sounds that have been digitally recorded from an actual tractor truck. Note:Always use 540 Type motor included in kit otherwise the electronic speed controller in the MFC-01 Unit may malfunction. with some chassis,back lamp,front and rear auxiliary lights,and/or speed indicator cannot be turned on. Some chassis require extra holes for installation.Use 4mm pin vise for making holes. 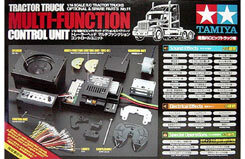 Note:Tractor Truck Electrical Unit Set(Item: 56501),Tractor Truck Sound Effect Set,and Components included in these items cannot be uesd with or substituted for this unit. This kit requires the folowing items:a 4ch Transmitter(self-neutral stick type with 4ch trims),a 4ch-receiver and 2 servos(3servos are required when installing 56505 motorized Support Legs.). No Electrical speed controlleris required as MFC-01 Unit covers that function.Receiver battery (6V)is not required. This kit is designated for employing FUTABA,JR or ACOM's R/C unit.Be aware that some R/C units employing no self-neutral system may not realize optimum operation and some sonnectors may not be compatible. It is recommended to use transmitter or one without trims should not be used at all. PCM receiver,multi-channel receive and older SANWA receivers(with black case are not available for this kit.